Mobile phones are poised to be the world’s most pervasive technology, already outnumbering land lines, personal computers, and even people in some counties. Unfortunately, solutions to address the usability challenges of using devices on the move have not progressed as quickly as the technology or user distribution. Our work specifically considers situations in which a mobile user may have only one hand available to operate a device. To both motivate and offer recommendations for one-handed mobile design, we have conducted three foundational studies: a field study to capture how users currently operate devices; a survey to record user preference for the number of hands used for a variety of mobile tasks, and an empirical evaluation to understand how device size, interaction location, and movement direction influence thumb agility. 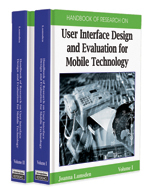 In this chapter we describe these studies, their results, and implications for mobile device design. Flip Phone: A popular form factor for a mobile phone that structures the phone into two halves that are hinged like a clamshell: the numeric keypad is placed on the lower half, and the display is placed on the upper half. In the closed position the screen and the keypad are protected from inadvertent damage or activation, while in the open position users can angle the screen for optimal visibility. Mobile or Cellular Phone: A portable electronic device which, at a minimum, supports long-range telecommunications. Today’s mobile phones support a much broader range of functions for personal data and data management activities, including data exchange with a personal desktop computer, music play, and photo capturing. Candybar Phone: A traditional-style mobile phone with a rigid rectangular form, typically about 3 times longer than wide. Ergonomics: Often used synonymously with “human factors,” ergonomics is the scientific discipline concerned with the understanding of interactions among humans and other elements of a system, and the profession that applies theory, principles, data and methods to design in order to optimize human well-being and overall system performance (definition adopted by the International Ergonomics Association in August 2000). PDA: Personal digital assistant. The original handheld device designed expressly for supporting personal data management on the go. PDAs typically have touch sensitive screens and are operated with a stylus. Recent models may also include a miniaturized Qwerty keyboard for text entry. Biomechanics: The study of muscular mechanics and activity.